A terrorist stabbing attack was thwarted Monday afternoon near the town of Tapuach in Samaria. The terrorist approached Border Patrol officers standing at Tapuach Junction, and attempted to attack him with a large knife but was shot and neutralized. The officer was very lightly wounded by the stabbing, while the terrorist died of his wounds shortly after. 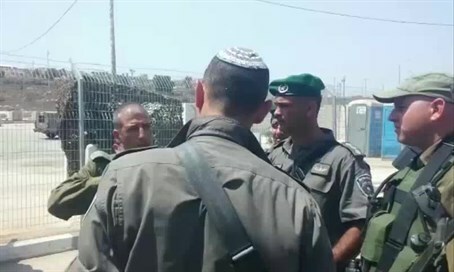 The Border Patrol released a statement saying that "a Palestinian arrived at Tapuach Junction and approached Border Patrol fighters manning the checkpoint and addressed them, saying that he didn't feel well. They ordered him to approach, and when he arrived in close-range he drew a knife and tried to stab one of the fighters." "The fighter was lightly wounded and succeeding in repelling the terrorist, while the other fighter cocked his weapon and shot the terrorist, neutralizing him. The terrorist was critically wounded." This latest incident follows two separate stabbings by terrorists on Saturday, in those cases targeting security forces. The second of those incidents occurred close to the site Monday's attack, when a terrorist stabbed a border police officer, wounding him in the back. Police quickly opened fire and killed the terrorist. Earlier Saturday, an Arab terrorist stabbed a soldier near a checkpoint on highway 443 in Samaria. The soldier, who was lightly wounded, managed to draw his gun and wound the terrorist in the shoulder, after which he was taken into custody. In that case as well, the would-be attacker managed to get close to his victim by asking for a drink. The chilling tactic is often used by Palestinian terrorists against Israeli civilians as well as security forces. In June, 25-year-old Israeli hiker Danny Gonen was murdered by an Arab terrorist, who gunned him down at point-blank range after luring him closer by asking for some water.